SJC sponsors several competitive shooters across a number of disciplines. We thank them for choosing our products to gain their competitive advantage. Steve Foster is a 6 Division Grand Master in Steel Challenge with over 30 major titles in his shooting career. He is also Team captain of the Steel Target Paint Shooting team. 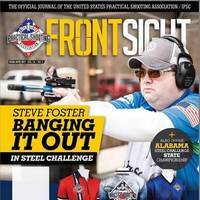 Front Sight Magazine featured Steve on the front cover for the Mar/Apr issue of 2017 shooting his Buckmark outfitted with a SJC Comp, SJC Thumbrest, and SJC Magwell. In 2016 Steve took 5 1st place finishes in pistol and rifle at the Alabama State Steel Challenge match, and in 2017 earned Rifle Master and 1st Place Pistol Caliber Carbine (PCC) at the Tier III East Coast Steel Challenge. At the 2017 Alabama State Steel Challenge Steve topped his season off with the fastest PCC match time ever recorded in a Level II or higher match, clocking in at 67.59s! Vince Taporowski has been shooting since he was 7 and now, at 75, shoots Steel Challenge as a Super Senior out of Key West, FL. He has been Pro Staff Shooter for Tactical Solutions (TacSol) for many years with 22 caliber pistols and rifles. 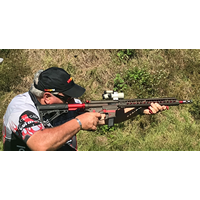 He travels extensively to matches throughout the year including: Florida State Steel Challenge, Mississippi, Alabama, PA, Georgia and The NSSF World Shoot in Florida. 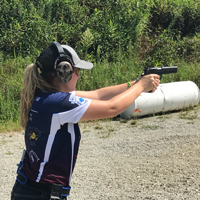 Zoey Bragg, at 12 and shooting out of Indiana, was the 2017 Steel Challenge Youth 22 Open Pistol and Rifle National Champion and the NSSF Rimfire Challenge Youth World Champion. She uses SJC comps on her rimfire guns and in 2018 is starting out in centerfire Limited with her Glock 34 built by SJC. Mackenzie Bragg out of Van Buren, Indiana, is at 14 off to a great start in her shooting career. She was the 2017 US Steel Challenge Ladies 22 Open Rifle National Champion and the NSSF Rimfire Challenge Ladies Open World Champion. Shooting with the SJC comp she has been mainly focused on 22 Open rifle and pistol but over the Winter will be working with SJC to develop the best centerfire setup for her. 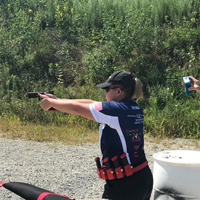 She credits John Nagel and SJC for the advice and training that led her to the 2017 rimfire titles. “John has been my friend and mentor since I started shooting and I hope to be shooting one of his 9mm by Nationals”, she says. Ron Oliver has always been an avid shooter starting at a young age plinking with his father and progressing into competition with shotguns at High School. In 2010 Ron won his first State title, with his first National title coming at the Ruger Rimfire Challenge in 2011. 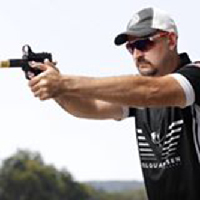 In 2014, as part of the Volquartsen Team, he won the U.S. Steel Challenge and the USPSA World Steel Challenge in Rimfire Rifle and by the close of 2017 had won over 20 State and National titles. His big joy is helping other shooters, both young and old. 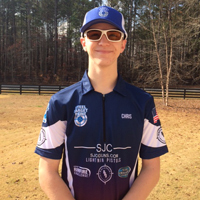 Chris Barrett got his first 10-22 at age 12 and competed in local events for several years, but in 2017 he began competing at larger events with great success. He was the 2017 Alabama State Rimfire champion in Junior Limited Division, the 2017 Missouri State Rimfire Junior champion, and at the 2017 Alabama State Steel Challenge Championship earned his GM in Rimfire Rifle iron division. He also joined the famed “One second club” shooting an amazing .89 in two different Steel Challenge events. Chris uses SJC comps and is currently having two Buckmark pistols and two Magnum Research rifles fully customized by SJC for the 2018 campaign. Chris says, "John Nagel has helped me tremendously this year; he has helped me navigate my way with his knowledge of equipment and experience in shooting sports."